Why Our Affordable AR Office Interior Design Perth Fit Out is Best? Perth’s best office layout designer photographs the interior of your Perth office with our augmented reality (AR) camera. Back at our design office, she comes up with innovative new office interior design options that are THE best in Perth. Select fly through designs from augmented reality (AR) views, showing what YOUR Perth office would look like after a fit out by our experienced shop and office fitters. Free office designs to choose from come with every office fit out project commissioned in Perth. Designs and prices suited to fit Perth start-up office budgets. Fast installation of office partitions and office workstations for a new office fit-out after you choose an interior design which matches your liking and budget. Our office designs are fully tax deductible for all commercial office fitouts in Perth. Our office designs are fully prefabricated from strong light weight materials for easy shipping and assembly. The installation proceeds quickly with a minimum disruption to your business. The reconfiguration of your office design is easy and without leaving carpet marks. 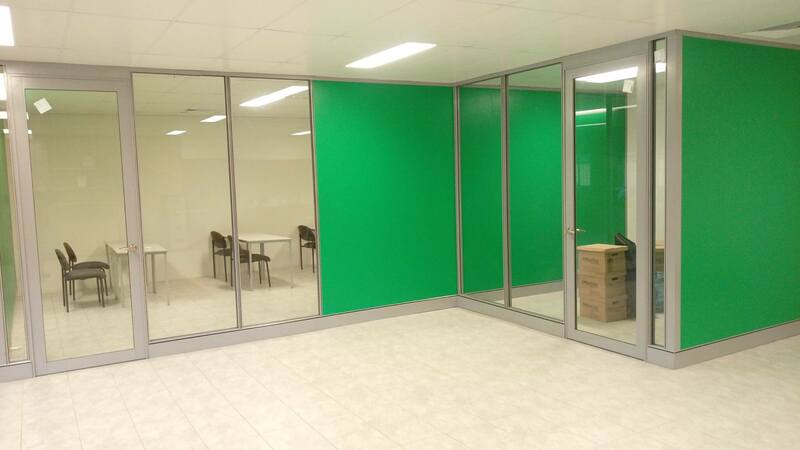 Moving your demountable office partitions and workstations to a new Perth office location is easy. The partitions when installed are designed to replicate the standard gyprock or study walls but at a fraction of the price. Being classed as an office furniture system due to it not being load bearing or it’s non-permanent nature and the fact the panels can be reused with relative ease at a new premise or sold as a second-hand product. 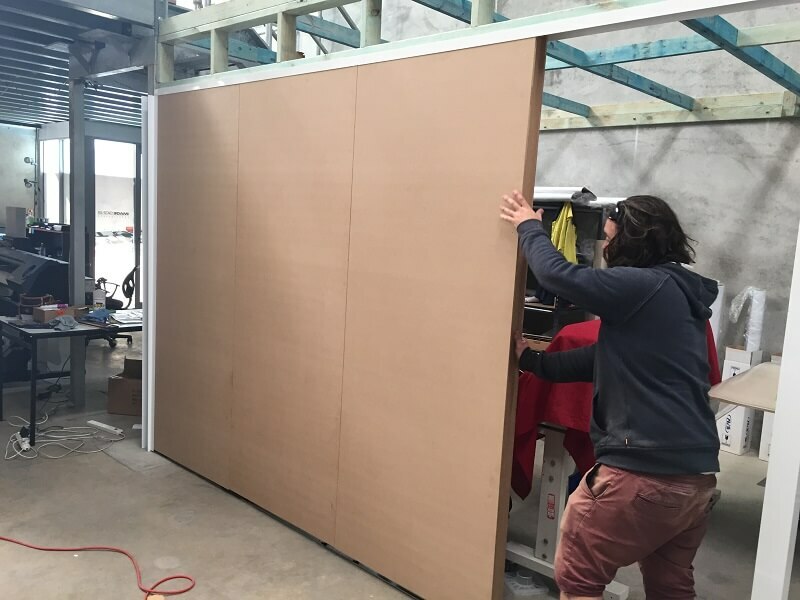 As mentioned if you get our Perth Partition Company to complete your dream Perth office design fit out, we’ll throw in the design component FREE of charge. We can rival the price between the Stud walls and Gyprock walls meaning that we are now a preferred option for workshop installs into Perth offices. 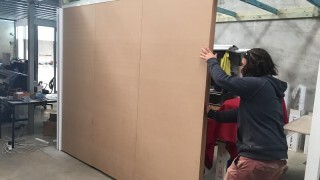 We can install these demountable MDF panels at an extremely low price. Office partitions can be left raw or painted/covered in fabric if you need a classier look which design options can reveal. The best thing is, our innovative, modern office designs in Perth integrate with our existing premium office system seamlessly. Glass to MDF panels is made simple by utilising our new internal shaped MDF connector piece, meaning there is no compromise in strength or aesthetics. After your office design is settled, we’re not waiting on external office materials suppliers so jobs get done quickly. We ARE the supply chain! Metal, fabrics and other materials go in to our office designs. Acoustically rated offices come out. Vertical integration means no compromises and cuts out the middleman, which is a Perth office fit out cost saving we pass directly to your business. Thanks to our proprietary office design systems and manufacturing process, Perth offices can be reconfigured as your company changes size without leaving trace marks of old office layouts.